At long last, following publication of certified entities as well as the numbers of entities and coalitions, the Iraqi electoral commission has released the list of the constituent elements of the 39 electoral lists in the 30 April Iraqi parliamentary elections that are coalitions of more than one party. The list is to some extent helpful in forming a more precise picture of the strength of the various lists and the competition between them. With regard to the big and well-known lists, there aren’t that many surprises. The core line-up of the State of Law alliance of Prime Minister Nuri al-Maliki is confirmed as the two main Daawa branches, the Shahristani bloc and Badr. The new list confirms that the Risali movment of ex-Sadrist Adnan al-Shahmani is also on the State of Law ticket. The Turkmen minister for the provinces who played a central role in the recent announcement of new governorates is also on Maliki’s list. Another noteworthy minority representative is a Shabak politician, Hunayn al-Qaddo. Qaddo was previously an advocate of the territorial integrity of Nineveh governorate in the context of Kurdish expansion. He has however congratulated the Shabak on the news of the establishment of the Nineveh plains governorate. Perhaps the most noteworthy aspect regarding the Shiite Islamist Muwatin alliance associated with Ammar al-Hakim and ISCI is the inclusion of a former Maliki ally, Ali al-Dabbagh. Ahmad Chalabi is also here (rather than with the Sadrists, whose election alliance with ISCI in 2009-10 he played a key role in forging), and Fawaz al-Jarba of the Shammar tribe constitutes a mostly symbolic Sunni representation. Basra is particularly well represented in the ISCI alliance, with the party of Shaykhi leader Amir al-Fayiz alongside businessman Tawfiq Abbadi and others. None of the other main Shiite “coalitions” (the Jaafari branch of the Daawa; Fadila; the Sadrists) offer much in the way of complexity. Jaafari has picked up Muhammad Kazim al-Hindawi who was formerly with Fadila, as well as the Hizbollah party of Abd al-Karim al-Muhammadawi (not to be confused with the other Hizbollah parties in Iraq that originated with Iranian sponsorship). One interesting thing that does emerge from the list, however, is the overall Shiite strategy (or lack of such strategy) in the Shiite minority provinces of Nineveh, Diyala and Salahaddin, where each governorate seems to present a solution of its own. Firstly, there is Diyala, where all the main Shiite parties except ISCI are represented on what amounts to almost a pan-Shiite ticket (coalition C10). Note however, that this list was not given a proper election number in the lottery, so it may have disintegrated in the last minute! Conversely, in Nineveh, every Shiite party is on the Shiite list except Daawa, and this list is definitely running as number 227. But in Salahaddin, things are even more complicated, because there are two Shiite tickets with more or less the same name (variations of the National Alliance, tickets 222 and 249). The first of these two Shiite lists, 222, consists basically of the Sadrists and the party of Ahmad Chalabi. The second list includes most of the other parties, including, uniquely, both Daawa and ISCI. With respect to the main Sunni and/or secular coalitions that have emerged from the ashes of Iraqiyya, there are also relatively few surprises beyond the three-way split between Nujayfi, Allawi and Mutlak. It is confirmed that Nujayfi has picked up most of the prominent sub-entities in the old Iraqiyya, including the parties of Zafir al-Ani and Muhammad al-Karbuli and figures like Ahmad al-Masari and Talal al-Zubaye. The tribal leader Ahmad Abu Risha is also in the Nujayfi coalition. For his part, Ayyad Allawi has picked up some former members of Unity of Iraq, including the blocs of Hashim al-Hububi and Wathab Shakir. Abdallah al-Yawir serves as a (tentative) tribal counterweight against the Nujayfi list in Nineveh. Perhaps the most interesting information in this latest IHEC document concerns two of the smaller coalitions, about which less was known beforehand. Firstly. it is confirmed that Ali al-Fayyad, formerly of the State of Law coalition, has gone ahead with his own coalition (list 226). Alongside the defection to ISCI by Ali al-Dabbagh, this serves to underline a degree of turbulence even in circles that were once considered quite loyal to Maliki. Second, there is the rather large coalition (in number of constituent elements) that is known simply as the Coalition of Iraq, and that has been given ticket number 262. 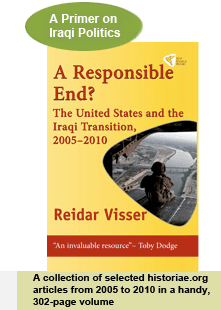 Conceptually, it seems related to the Unity of Iraq coalition in the 2010 election, with a sectarian mix, many seculars and at least attempts at bringing together elements from different parts of the country. The core seems to be the groups that first broke away from Iraqiyya following the conflict between Maliki and (vice president) Hashemi in late 2011: Free Iraqiyya and Wataniyun. Alongside them are, among others, Ali al-Sajri, a former (Sunni) minister of state with a working relationship with Maliki, and Mahdi al-Hafiz, a former (Shiite) planning minister with a background in Iraqiyya. In his quest for a third term, it seems logical that PM Maliki should be looking to a list like the mixed list 262 to provide a Sunni-secular alternative partner to Nujayfi (whom he considers too strong) or Allawi (whom he cannot work with). How strong this list really is (and how strong Mutlak, another wild card and chameleon is) will to some extent be revealed by the candidate lists. These may take a few more weeks to emerge, following certification of individual candidates including de-Baathification measures. This entry was posted on Sunday, 2 February 2014 20:44 at 20:44	and is filed under Iraq parliamentary elections 2014. You can follow any responses to this entry through the RSS 2.0 feed. Both comments and pings are currently closed. I can’t find it in the latest list, but will double-check. The only news about Iraq trickling into the U.S. is uniformly terrible as though it is about to burst into civil war again at any minute. Can you give some perspective? Do you anticipate that the elections can be carried out? Regarding elections, I hear the rumours about Maliki wanting to cancel them but ask myself whether that really would be in his interest? I think he might still be looking for a boost from voters.